A new Murdoch University-led study has highlighted the relationship between the loss of Australian digging mammals and ecosystem decline. 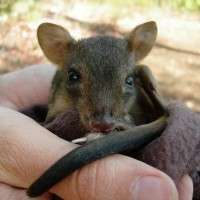 Referred to as 'biotic engineers' by researchers, species such as bilbies, bandicoots, potoroos, echidnas and woylies have been highlighted for their impact on soil health and ecosystem functioning. "Most Australian soils are nutrient-poor and are greatly dependant on external processes to support environmental health," said Associate Professor Trish Fleming. "Digging mammals play a vital role, creating disturbances in the form of nose pokes, scratchings, shallow and deep digs, long bull-dozing tracts and complex subterranean burrows. "These interactions lead to soil turnover, nutrient mixing, better breakdown of organic materials, seed dispersal and improved infiltration of water, which decreases surface runoff and erosion. "For example, water infiltration in foraging pits created by echidnas is approximately twice as great as in undisturbed soils, and the breaking up of the hard soils allows seeds to find suitable sites for germination." Professor Fleming said the amount of soil shifted by digging mammals was astonishing. A southern brown bandicoot can excavate over 3.9 tonnes of soil per year, while a woylie will create between 20 and 100 excavations every night. She said these amounts had to be considered against the fact that over the past 200 years around half of all digging mammals have been declared extinct or have come under conservation threat. "Australian ecosystems have been undergoing a massive loss of ecosystem processes, including higher tree mortality rates, episodic die-offs and general decline in the number and vitality of plant species," she said. "Meanwhile, Australia has had a higher record of extinction of mammal species over the last 200 years than any other part of the world. "The role of these animals is largely unrecognised, and research and management targeting of these species need to be undertaken as a matter of some urgency." 'Is the loss of Australian digging mammals contributing to a deterioration in ecosystem function?' has been published in Mammal Review.